Major General Sibusiso Moyo, Chief of Logistics of the Zimbabwean army. ZIMBABWE’S MILITARY WAS in control of the country today as President Robert Mugabe said he was under house arrest, although generals denied staging a coup. His wife, Grace Mugabe, was said by opposition sources to have fled the country for Namibia, although that has not been confirmed, reports the Guardian. Mugabe’s decades-long grip on power appeared to be fading as military vehicles blocked roads outside the parliament in Harare and senior soldiers delivered a late-night television address to the nation. “The president… and his family are safe and sound and their security is guaranteed,” Major General Sibusiso Moyo said, slowly reading out a statement. 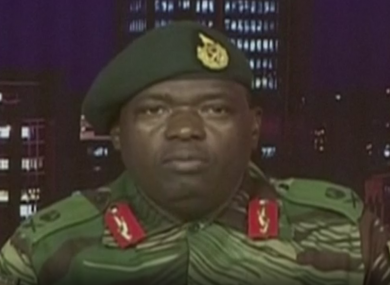 Moyo said: “This is not a military takeover of government”. But the general’s actions posed a major challenge to the 93-year-old Mugabe, who has ruled Zimbabwe since independence from Britain in 1980. The African Union, in a strongly-worded statement, said the crisis “seems like a coup” and called on the military to immediately halt their actions and respect the constitution. Alpha Conde, who is also Guinea’s president, said the AU condemned the actions of top brass in the southern African nation as “clearly soldiers trying to take power by force”. Neighbouring South Africa’s President Jacob Zuma, one of Mugabe’s closest allies, said he had spoken to the veteran leader by telephone. Mugabe “indicated that he was confined to his home but said that he was fine”, the South African government said in a statement that called for calm and restraint. Tensions between Mugabe and the military establishment, which has long helped prop up his authoritarian rule, erupted in public over recent weeks. The ruling ZANU-PF party yesterday accused army chief General Constantino Chiwenga of “treasonable conduct” after he criticised Mugabe for sacking vice president Emmerson Mnangagwa. Mnangagwa’s dismissal had left Mugabe’s wife Grace, 52, in prime position to succeed her husband as the next president — a succession strongly opposed by senior ranks in the military. As the situation deteriorated overnight, the embassies in Harare warned its citizens in the country to “shelter in place” due to “ongoing political uncertainty”. Today, state television played liberation struggle songs, while many citizens in Harare shopped at markets, drove to work or queued outside banks despite the turmoil. Due to the political uncertainty in Zimbabwe at this time we advise all Irish citizens to remain indoors and to avoid areas where demonstrations may be taking place. Prolonged gunfire erupted near Mugabe’s private residence in the suburb of Borrowdale early this morning, a witness told AFP. No further details were available. The armoured vehicles spotted outside Harare also alarmed residents as Chiwenga had warned of possible military intervention. The army’s spokesman was not available to comment. “We very rarely see tanks on the roads,” Derek Matyszak, an analyst at the Pretoria-based Institute for Security Studies, told AFP. Chiwenga threw down the gauntlet to Mugabe… it would make sense for Chiwenga to organise some military manoeuvres to up the ante. It’s clear we are entering new territory here. Mugabe is the world’s oldest head of state, but his poor health has fuelled a bitter succession battle as potential replacements jockey for position. Some of the army top brass are seen as strongly opposed to Grace Mugabe’s apparent emergence as the likely next president. In speeches this year, Mugabe has often slurred his words, mumbled and paused for long periods. His lengthy rule has been marked by brutal repression of dissent, mass emigration, vote-rigging and economic collapse since land reforms in 2000. The main opposition MDC party called for civilian rule to be protected. “No one wants to see a coup… If the army takes over that will be undesirable. It will bring democracy to a halt,” shadow defence minister Gift Chimanikire told AFP. Speculation has been rife in Harare that Mugabe could seek to remove Chiwenga, who is seen as an ally of ousted Mnangagwa. The crisis marks an “ominous moment in the ongoing race to succeed” Mugabe, said political analyst Alex Magaisa in an online article. [Mugabe] has previously warned the military to stay away from ZANU-PF’s succession race. His authority over the military has never been tested in this way. Mnangagwa, 75, was widely viewed as Mugabe’s most loyal lieutenant, having worked alongside him for decades. He fled the country and is thought to be in South Africa. Earlier this year the country was gripped by a bizarre spat between Grace and Mnangagwa that included an alleged ice-cream poisoning incident that laid bare the pair’s rivalry. Grace Mugabe – 41 years younger than her husband – has become increasingly active in public life in what many say is a process to help her eventually take the top job. Email “Zimbabwe crisis: Mugabe 'under house arrest' after army seizes control”. Feedback on “Zimbabwe crisis: Mugabe 'under house arrest' after army seizes control”.